Striking the right note !!! The Principal and staff have appreciated Reshma's efforts and wished her success in all her future endeavours. 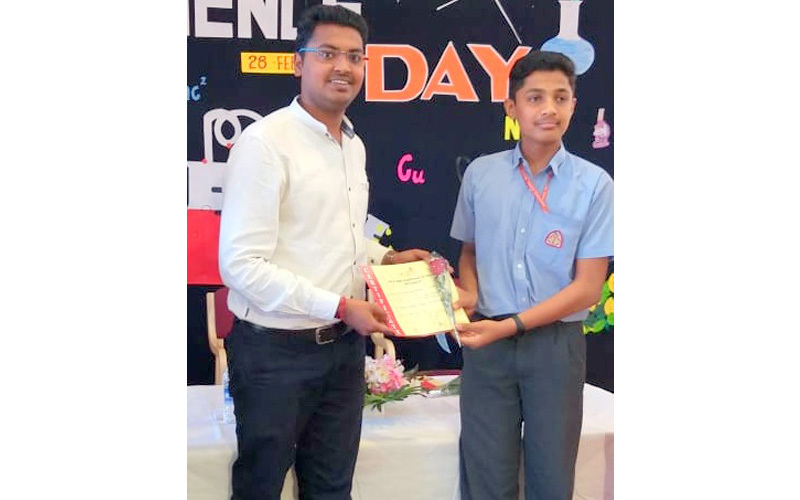 Master Eshaan C. Patil of class 8 had actively participated in the National Level Space Science essay competition conducted by Go4Guru in association with Astronaut Memorial Foundation and Florida Institute of Technology through the Hindu Educational Series. 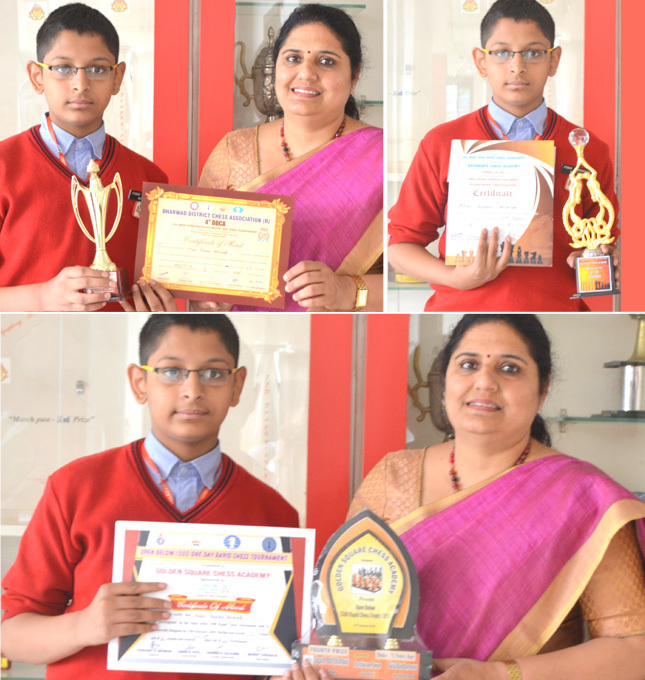 Eshaan has been selected as the best performer for which he was awarded a certificate and he is now eligible to attend the International Space Science Conference at NASA, Kennedy Space Centre, USA in the month of May, 2019. The NASA program includes three full days of conferences and guided instruction, led by experienced educators apart from availing great opportunities for securing scholarships, sponsorships s and discounts in top USA universities. USA based Go4Guru Inc., has been organizing events and conferences in USA for school students. Principal, Dipti Ingley has congratulated Eshaan on his astounding performance and wished him all the best in his forthcoming venture at NASA. Arriving at one goal is the starting point to another! · 4th DDCA All India Open Fide rated below 1600 Chess Tournament held at Huballi from 26th to 28th January, 2019. Raees Ahmed scored 6.5 points out of nine rounds(U/14) and secured 2nd place from amongst 635 participants. · Open below 1500 Rapid Chess Tournament held at Hindwadi, on 17th February, 2019 organised by Golden Square Chess Academy. Raees Ahmed scored 5 points out of rounds (U/15) and secured 4th place from amongst 156 participants. · Belagavi Open Rapid Chess Tournament held at Belagavi on 19th and 20th January, 2019 was organised by Bachikar's Chess Academy and Raees Amed was ranked 5th(U/16) with 6 points and was awarded with a cash prize of Rs.1000/-. Principal Mrs. Dipti Ingley congratulated Raees Ahmed on his meritorious performance and wished him the best in all his future ventures. Achievers are not born talented but they possess the, 'I can do it' attitude. Miss Sharadhi Hegde has been awarded the Cultural Talent Search Scholarship for the year 2018-19 in the field of Hindustani Music- Vocal. She succeeded in getting the scholarship in her first attempt at the tender age of 11. Sharadhi is studying in class 5 at KLES' International School, Belagavi. She is learning Hindustani Vocal from Shri VM Shirasat and Pandit BM Pujar. This scholarship is awarded by Centre for Cultural Resources and Training (CCRT), Ministry of Culture, Govt. of India, New Delhi, for the achievers between the age group of 10 to 14 years. Every year, 500 talented students from all over the country across various art forms (including all dance forms, Music, Drawing, Painting etc.). The exam was held at Bengaluru on 29th June, 2018. 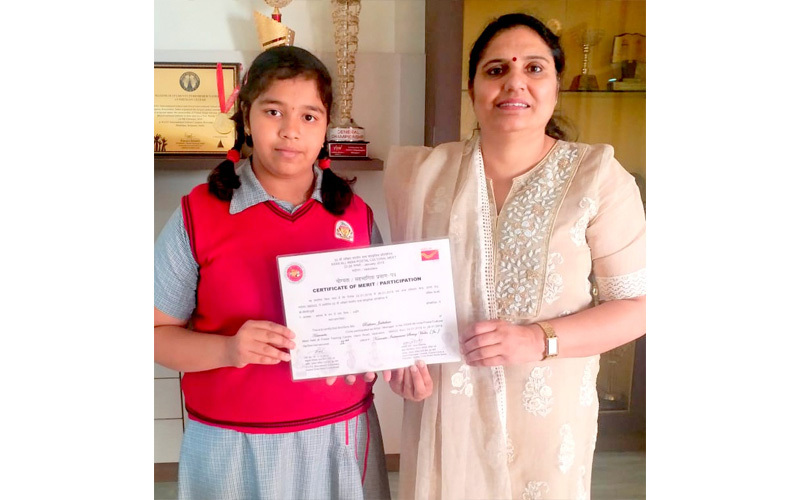 She has also secured the SECOND prize in Patriotic Song competition (Hindi) by Swami Vivekananda Institute of Commerce, Belagavi- Jan. 2018, the Hindustani Shastriya Gayan competition by Arts Circle, Belagavi- 2018 and the ‘Kala Yana’- KLE International School Art competition- 2018, respectively. 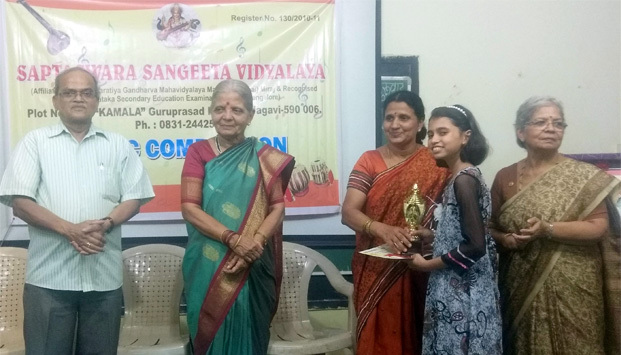 The CONSOLATION prize in Hindustani Classical Light Music (Solo) by Saptaswara Sangeeta Vidyalaya, Belagavi- Sept. 2018 is another feather in the cap. · Silver Zone Foundation GK Olympiad 2017.Secured 1st Position in class and 2nd State Rank. · Silver Zone Foundation International Olympiad of Mathematics 2017. Secured 1st Position in class. · Silver Zone Foundation Talent Hunt Olympiad 2017. Secured 1st Position in class and 3rd State Rank. · Silver Zone Foundation International Olympiad of Science 2017.Secured 1st Position in class. · Silver Zone Foundation International Olympiad of Science 2017-18 (Level-2). Secured 1st Position in class; and 8th State Rank with 93.669 Marks. · Silver Zone Foundation International Social Studies Olympiad 2017. Secured 1st Position in class and 20th State Rank. · Silver Zone Foundation International Olympiad of English Language 2017-18 (Level-2). Secured 1st Position in class; 1st State Rank and 15th Olympiad Rank with 91.62 Marks. · Silver Zone Foundation International Olympiad of English Language 2018 .Secured 1st Position in class and 5th State Rank. · Unified Cyber Olympiad- 2018. Secured 1st Rank for South Zone (Karnataka, Kerala). · Rashtrabhasha Vikas Parishad- Adarsha Vidyarthi Puraskar- 2018 . Achieved First-A Grade. Principal, Mrs. Dipti Ingley has appreciated Sharadi for achieving such dizzying heights at such a tender age and wished her loads of fame and success in the near future. A dream becomes a goal when action is taken towards its achievement ! Miss. Urvi Shetty has been awarded the Cultural Talent Search Scholarship for the year 2018-19 in the field of Hindustani classical dance( Bharatanatyam). Miss. 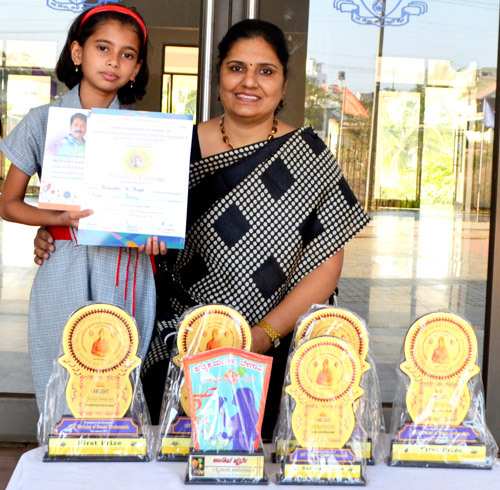 Urvi Shetty of class 8 studying in KLES' International School, Belagavi, was declared the Finalist in Natyaratna Bharatanatyam Reality Show Grand Finale-Juniors. The award was presented by Sankara TV & Venki Films. Principal, Mrs. Dipti Ingley has congratulated Urvi on her brilliant success and wished her the best in all her future endeavours. 'Top Sports Talent of Karnataka 2018-19'. Master Mandar Maruti Desurkar of KLES' International School, Belagavi was felicitated and honoured with the title, 'Top Sports Talent of Karnataka 2018-19'. This spectacular event was held at Gamatics and IIMB(Indian Institute of Management, Bangalore) in association with NSREL and organized by KHEL Foundation , STEPP(Sports Talent Exploration and Promotion Program) Karnataka Program 2018-19 on 3rd January, 2019. This program was conducted to recognize and award the budding talents of Karnataka in the field of sports. 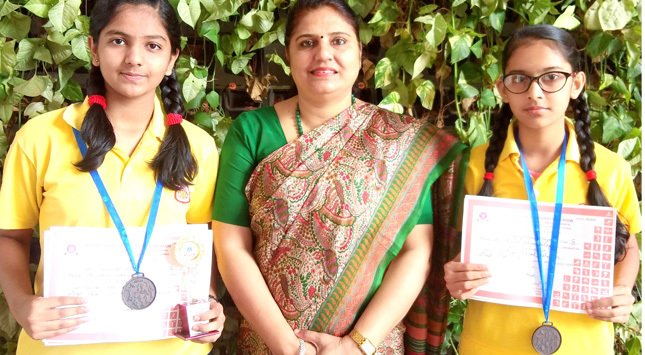 Miss Shamali Kiran Patil(Grade 9) of KLES' International School, Belagavi, had participated in the National Championship(Table Tennis) at Kanshalya World School, Noida from 20th - 24th November, 2018 in the U/17 girls category. Striving hard for excellence and success! Central Board of Secondary Education conducted Inter School Table Tennis Cluster sports and games competition, 2018-19, from 16th to 18th September, 2018 at Jain Heritage School, Belagavi. 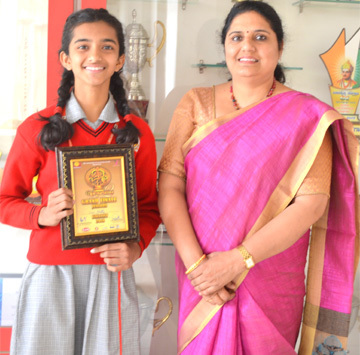 Miss Shalmali Patil of Class IX of KLES' International School secured second position in under 17 yrs. age group and has been selected for under 17, individual competition to be held at Delhi from 21st November, 2018. Miss Vijaylaxmi Nayak and Miss Shalmali Patil of Class IX have secured third position in under 17, girls team event. When love and skill come together, expect a masterpiece !!! Madhuban Educational books had organized 'Hindi Hain Hum' on the occasion of Hindi Diwas Samaroh on 14th September,2018 at New Delhi, to felicitate proficient Hindi teachers, all over the country. Smt. Mrudula Sinha, Governor of Goa was the Chief Guest on this occasion. Ms.Bharati Nagnoor ,H.O.D, Hindi Department of KLES' International School, Belagavi was felicitated by Dr.Pradeep Kumar Jain, Educationalist and Professor Irtheja Karim, Director (NCPUL),for her outstanding contribution in making Hindi Language and Literature, creative, progressive and innovative. Opportunities are meant to be manipulated but not missed !!! The ' All India Karate Assosiation of India', held the Dan Grading exam in Mangalore on 9th September,2018, in which Mr. Akash Madhu Patil, the karate instructor in KLES' International School, Belagavi, successfully completed his 2nd Dan (Ni-Dan in Japanese). Mr. Ravi Kumar, Karate Do-India and Grandmaster, Mr. Hanshi B.M. Narsimhan were the examiners who tested Mr. Akash, in a variety of techniques and finally adjudged him, successful in his endeavor. Mr. Madhu Patil, the karate instructor of KLES’ International School, Belagavi, has once again proved that when it comes to success and excellence, nothing but the best matters. Over the years, the amount of adulation and respect that Mr. Madhu Patil has received, definitely speak volumes about his hard work and dedication towards karate. He has been conferred with the title of ‘Accredited Coach of Karnataka’ and ‘National Coach for the National Body’ in Mumbai on 27th May, 2018 by the President, Mr. Thiagarajan, Secretary, Mr. Bharat Sharma and Commission Chairman, Mr. Premjeet Singh. It is certified by W.K.F. 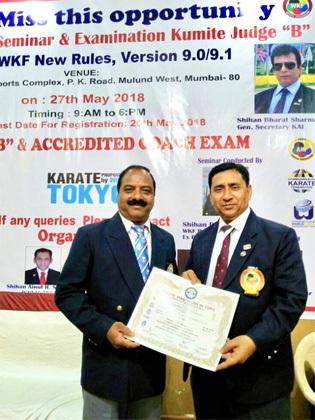 ( World Karate Federation) and Karate Association of India. 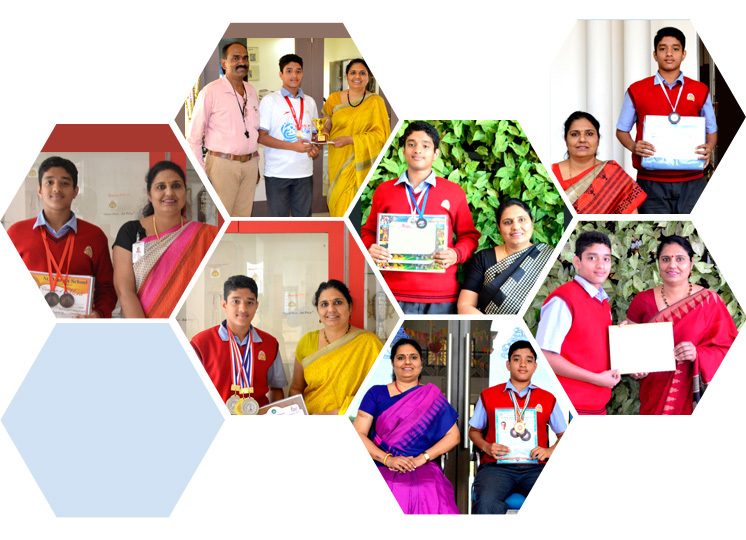 Principal, Mrs. Dipti Ingley and the entire staff of KLES’ International School, Belagavi has congratulated Shihan Madhu Patil sir on his meritorious performance. Miss. 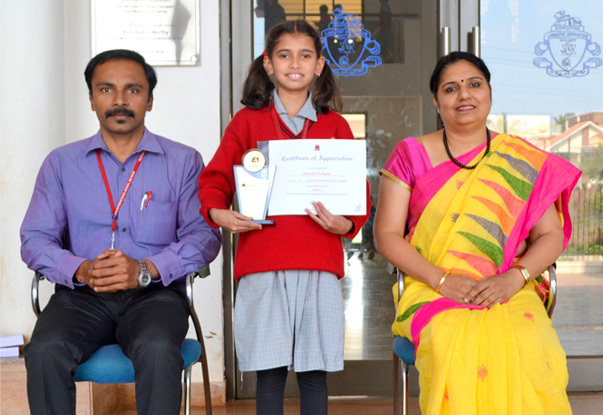 Sharadhi H. Hegde of Class IV won the Subject Topper Award, for her outstanding performance in English in ASSET Summer 2017. The main purpose of the ASSET test is to help students, teachers and parents diagnose the strength and weaknesses of students. It is thus meant for all students – not only toppers. However to recognize top performing students and inspire their classmates to try harder, excellence in ASSET is recognized through special awards given to the subject toppers. Principal, Dipti Ingley congratulated Sharadhi on her success. 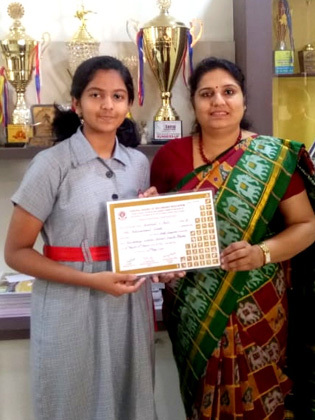 Gungun R. Patil of KLES’ International school, studying in class IIIB, has been felicitated by Ammana Madilu Charitable Trust, Vijapur for her great achievement in Yoga. She has been awarded the State Level Shangu Biradar Bal Pratibha Award on 30th November, 2017. She has been presented a Memento and a Certificate. Our Principal, Mrs. Dipti Ingley has congratulated her for this special achievement. Secured 16th rank at the National Level UCO (Unified Cyber Olympaid) – 2016, 2nd Level held at Bangalore. She is been awarded with cash prize of Rs 500/-, Book Prize: Reasoning Trainer plus, Pre-paid Scratch card of MAPMYSTEP.com, CD, Medal and Certificate of Appreciation. Won first position in G.K Quiz, Essay, Patriotic song, Bhagavad Geeta Chanting Competition and she also secured Second place in Elocution competition organized by Swami Vivekananda Institute of Commerce and Computer Education on the occasion of the 155th Birthday Celebrations of Swami Vivekananda (The National Youth Day -12th Jan. 2016). Won 2nd place in Drawing Competition organized by Parivartan Pariwar (Abhay Patil)- Jan. 2016. Awarded a Tab in Funtoot Fundastar for the Month of Dec. 2016. Won 2 Gold in 8th Goshin-Ryu National Karate Championship, Mangalore in August 2016. · Won 3rd Place in 42nd Goshin-Ryu Malaysia Karate Championship in December 2016. Won 1st place in Mangalore 8th National Karate Championship in August 2016. Won 1st place in Kata and Kumite (J.S.K.A) Indo-Srilankan Open Karate Championship 2016. Won 4th Place in 42nd Goshin-Ryu Malaysia Karate Championship in December 2016. Participated in Karate Event -Goshin-Ryu Kumite and Kata Seminar in April 2016. Participated in Karate Event- Goshin-Ryu Kata and Kumite Seminar in August 2016. Won Second place in 100 mts. Butterfly organized by CBSE South zone Swimming Meet, Hyderbad in Oct. 2016. Won 1st position in 100Mts. Backstroke under group II, 2nd position in 2 events- 100Mts. Freestyle and 100Mts. Butterfly under group II organized by Digvijay Khanvilkar Foundation 2nd Invitational Open Age Group Swimming Competition – 2017 at Kolhapur in Feb 2017. Won Third position in two events, 100 Mts. Individual Medley and 50 Mts. Butterfly under group-II organized by St. Mary’s School, Belagavi in January 2017. Won Third position in 200 Mts. Individual Medley in Inter State Swimming Competition organized by Rotary Club of Ichalkaranji held on Jan. 2017. Won Silver Medal in 50 mtrs. Backstroke under Group II and Bronze Medal in 4X50 mtrs. Relay under Group I, II, III in Interstate Invitational Age Group Swimming Championship, Belagavi on Jan. 2017. Won 2nd prize in Speedo Goa Swimathon 2017 (Sea Swimming-2km) organized by Endro Sports held at Bambolim Beach Goa on 9th April 2017 under open category. He was been awarded with cash prize of Rs 1,200/-, Trophy and a Medal.